Beautiful sixteen-year old Elaine has a temperament as fiery as her long red hair. The daughter of a soldier in a young Arthur’s army, Elaine is the sole girl in a militaristic world of men. Often slipping into daydreams, she wishes that the handsome Lancelot would see her more than a tomboy. Then a new girl arrives, and Elaine is thrilled — until Gwynivere proves to be cold and cruel. But when Elaine and Gwynivere are thrown into a situation of gravest danger, the girls must band together in order to survive. Can Elaine find the strength to fight for the kingdom she has always believed in? This year is the year of novels in verse for me, and I have been trying to keep one on my TBR in case of a need for a quick read. Song of the Sparrow by Lisa Ann Sandell is one of those books that hovered by my radar but I never really got because…well I’m not sure anymore. But anyway, when I saw a copy of this for swap in one of our Goodreads meet-ups, I got it immediately (with cackles of delight because I got it first — then again I’m not sure if anyone else wanted this more than I did). Anyway, I haven’t read any book about Arthur or anything related to this legend, but I am a bit familiar because of all those Camelot-related cartoons and of course, Merlin. I wasn’t familiar with any other characters there, though, so this book came as a surprise and a bit of a crash course with the legend. Elaine of Ascolat is one of the two girls in the military camp where Arthur and his men stay to fight for Britain. Elaine’s only other companion is Arthur’s sister, who she loves but can’t talk to about her secret: that she is secretly in love with Lancelot, Arthur’s right hand man. Then another girl joins them in the camp, Gwynivere, and Elaine suddenly felt some competition for Lancelot’s affection. I wasn’t really afraid that I won’t like this book, but I also wasn’t expecting to really like it so much. Despite its historical/mythical nature, the passages in this book were very easy to read. It was easy to slip into Elaine’s world and imagine how it is to be the only girl in a camp of men, and treat the guys as old friends and brothers who you know will also watch out for you. I could also easily feel her frustration of not having a girl friend in the camp and even more so Elaine’s jealousy and anger when attention goes from her to Gwynivere. It may be the book’s format that somehow made the book a little more romantic than I expected it to be — poetry does have its merits in that department. Plus, I wasn’t expecting the romantic twist in the story, and how it was resolved really made me smile. Then again, I don’t know if the twist here is really a part of the Arthur legend, so maybe I’m the only one who’s surprised. But I believe, I continue, I know what true love is — or what it should be. What should it be? Tristan asks, his voice soft now. It should begin with friendship, I think. Suddenly I cannot look at him. and strengths and fears, knowing all of it. the person because of all those things. The romance in this one came as a surprise to me too. It definitely isn’t included in the Arthurian tales that I’ve read. 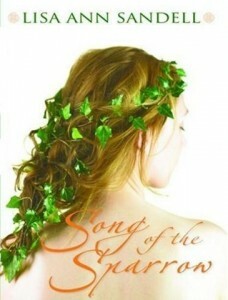 Song of the Sparrow was my first novel in verse and I loved it. I’m definitely going to read more of them. :) If you’re interested in more Arthurian novels, I highly recommend Elizabeth E. Wein’s books.